STEVE HACKETT - CURED REMASTERED (CD) | Online Shop | Wizard LTD.
Cured is the fifth solo album from former Genesis guitarist Steve Hackett. 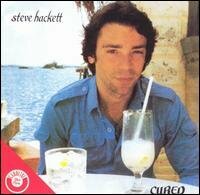 Prior to recording Cured, Hackett disbanded the group with which he recorded Spectral Mornings and Defector. Only Hackett's brother, John, and keyboardist Nick Magnus remained from that band. The album is largely a collaboration between Hackett and Magnus. All drum parts were provided by a drum machine, programmed by Magnus, and all lead vocals were performed by Hackett. Although there are distinct elements of progressive rock on Cured, the album is much more pop-oriented than Hackett's previous efforts. In 2007, Cured was remastered and re-released on Virgin Records. The new edition features updated liner notes and three bonus tracks. All songs by Steve Hackett except where noted.